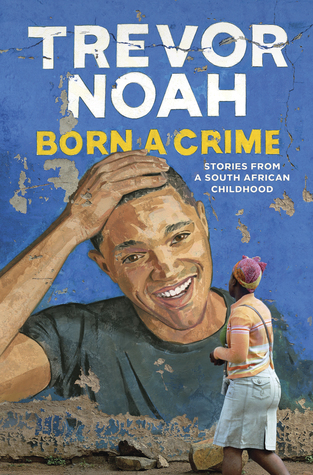 The second book in our year of 12 Months 12 Readalongs is Born a Crime by Trevor Noah. You might recognize Noah as the host of The Daily Show, but way before that he was a kid growing up in South Africa as "a crime": his very existence was illegal under Apartheid because his mom was black and his father was white. Born a Crime tells the story of his childhood. Born a Crime is the story of a mischievous young boy who grows into a restless young man as he struggles to find himself in a world where he was never supposed to exist. It is also the story of that young man's relationship with his fearless, rebellious, and fervently religious mother: his teammate, a woman determined to save her son from the cycle of poverty, violence, and abuse that would ultimately threaten her own life. The eighteen personal essays collected here are by turns hilarious, dramatic, and deeply affecting. Whether subsisting on caterpillars for dinner during hard times, being thrown from a moving car during an attempted kidnapping, or just trying to survive the life-and-death pitfalls of dating in high school, Trevor illuminates his curious world with an incisive wit and unflinching honesty. His stories weave together to form a moving and searingly funny portrait of a boy making his way through a damaged world in a dangerous time, armed only with a keen sense of humor and a mother's unconventional, unconditional love. Feel free to join in the discussion on your own blog, here in the discussion post comments, or even tag us on Facebook and Twitter using the hashtag #12mos12rals. See you back here in a few days for our first discussion!